This Springdale bunkhouse travel trailer 298BH will have you and your family enjoying every camping trip away from home. With quad bunks, a front bedroom, and a single slide out, you will have plenty of room to take along a few friends. 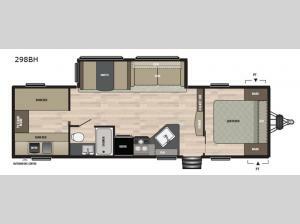 You will love having this much space with the large slide out and the bunkhouse in the rear. On a cloudy day, snuggle up on the sofa or dinette and read a book. On a sunny day, head outside and enjoy the great outdoors. In any Keystone Springdale travel trailer, you will find premium features to make your camping experience feel like a home away from home. Some of these features are a high rise kitchen faucet, a 6 cu. ft. refrigerator, storage under the master bedroom, and an AM/FM Bluetooth CD/DVD entertainment system. These fifth wheels and travel trailers will provide you and your family with all the travel conveniences you want and expect without costing you a fortune. Each model includes a powder coated l-beam frame, cambered chassis, Lion's head nitro filled tires, and hurricane straps to reinforce the structure are just a few of the exterior/construction standards that create a unit built to last.